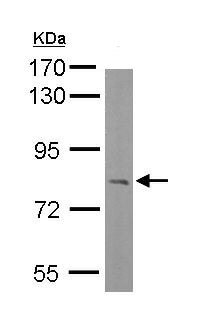 Recombinant fragment corresponding to Human INTS9 aa 368-658. WB: IMR32 and Mouse brain whole cell lysate. Our Abpromise guarantee covers the use of ab154660 in the following tested applications. WB 1/500 - 1/3000. Predicted molecular weight: 74 kDa. Component of the Integrator complex, a complex involved in the small nuclear RNAs (snRNA) U1 and U2 transcription and in their 3'-box-dependent processing. 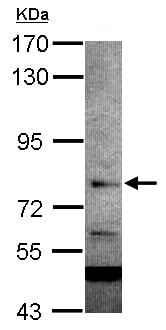 The Integrator complex is associated with the C-terminal domain (CTD) of RNA polymerase II largest subunit (POLR2A) and is recruited to the U1 and U2 snRNAs genes. Belongs to the metallo-beta-lactamase superfamily. RNA-metabolizing metallo-beta-lactamase-like family. INTS9 subfamily. ab154660 has not yet been referenced specifically in any publications. Publishing research using ab154660? Please let us know so that we can cite the reference in this datasheet. There are currently no Customer reviews or Questions for ab154660.